With my Bohus Red Palm swatch finished and blocked I can see how the texture of the purl stitches has softened and how the colours blend into one another. I can also tell that my original colour selection is a tiny bit off. Green has to go (that’s a given) and the pale pinks aren’t working. There is too much contrast between the fuchsia and dusky pink, and between the pale pink and white, and not enough between those tow shades. I have a new-found appreciation of how difficult it is to balance a complex colour scheme, it needs to be exactly right. I was forced (literally) to buy more yarn. 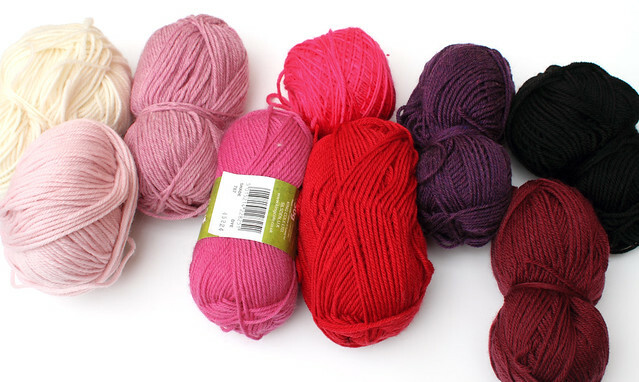 Luckily it was cheap, I picked up some bargain King Cole merino in bright pink, and some Artesano merino in very pale pink, both from Hejhog. I can see this combination being more successful. Now that the colours have been chosen, there is just the small matter of what to make… I do need a new hat, my Aduki Hat got left somewhere in Berlin. I prefer not to think about the fact that I’ve bought 9 balls of yarn (11 including the ones I’m not using) to make a hat. The advantage of fairisle is that there should be plenty left over for a matching scarf, gloves even leg warmers.